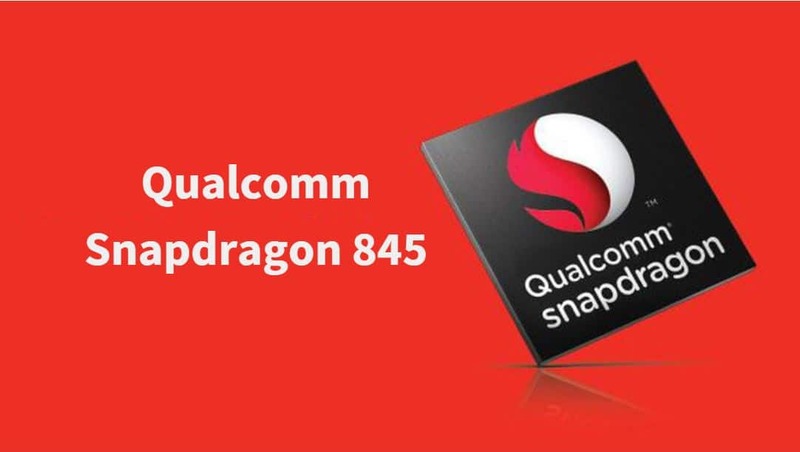 On 7th December 2017, Qualcomm announced their latest flagship mobile platform, the Snapdragon 845. The majority of 2018 flagship devices are going to be powered by this SOC. Samsung Galaxy S9 (US Variant), Xiaomi Mi Mix 2s, OnePlus 6, Sony Xperia XZ2, and the Xiaomi Black Shark are some of the phones that run on this chip. You’re at the right location if you were about to purchase a Snapdragon 845 device and not sure how well it performs. The hardest part about reviewing a flagship chip is that there is usually no drawbacks in both the specification and real-world performance. However, even though it is one of the most powerful smartphone processors as of now, Apple’s A11 Bionic chip is still ahead in terms of raw CPU performance. Moreover, the Samsung’s Exynos 9810 chip is slightly ahead of 845 in some of the aspects. You can refer to this article by Android Central that compares the performance of both these chips. The pros. and cons. of Snapdragon 845 are listed below. For obvious reasons, I prefer leaving the cons. section empty when I’m writing about a flagship product (as long as that product doesn’t have some serious issue). The Snapdragon 845 has two CPU clusters called the Kryo 385 Gold and Kryo 385 Silver. The Kryo 385 Gold cluster consists of 4 High-Performance Semi-Custom ARM’s Cortex-A75 Cores that are customized by Qualcomm for better Performance and Optimization. While the Kryo 385 Silver cluster has 4 Low-Powered Cortex-A55 CPUs and these too are customized by Qualcomm. The high-power cluster has a maximum clock frequency of 2.8 GigaHertz while the low-power cluster can go up to 1.8 GigaHertz. The codename of this chip is SDM845 and it is fabricated using Samsung’s 10nm FinFET LPP Process. Here LPP stands for Low Power Plus and FinFET is a type of non-planar transistor that offers better power efficiency. The Adreno 630 is one of the most powerful smartphone GPUs and it leaves all its competitors to dust. Instead of calling the Adreno 630 a GPU, Qualcomm has named it the Visual Processing Subsystem that includes the VPU, DPU, and the GPU. It supports on-display resolution of 4K (3840 x 2160 pixels) and 4k Video Playback at 60 FPS. Extended Reality is also supported. It has 4 Memory Channels that supports LPDDR4X RAM of 1,866 MHz Frequency. The maximum amount of RAM it can support is of 8 GB. X20 LTE Modem supports Gigabit LTE with maximum download speed up to 1.2 Gbps (Giga Bits per second) and upload speed of 150 Mbps. This SOC supports both Voice over LTE (VoLTE) and Voice over WiFi (VoWiFI). In fact, this chip supports Dual VoLTE and hence, you can use VoLTE on both the SIM Cards simultaneously. Isn’t that awesome? The latest Hexagon 685 DSP supports AI Processing that optimizes user experience while using AI-powered apps. This results in better blur/bokeh effect, Extended Reality, Battery Performance and all this leads to a better user experience. By using the Qualcomm’s Neural Processing Engine SDK, mobile application developers can optimize their software by on-device processing of ANN (Artificial Neural Network). It also brings in the support of Tensorflow, Caffe, and Caffe 2. Do you Know? Tensorflow is a library for Machine Learning Applications while Caffe is a Deep Learning framework. The next-generation Spectra 280 Image Signal Processor takes the Image Processing capabilities to an even higher level. You can capture 4K Videos at 60 frames per second. With 3D Structured Depth Sensing, facial recognization gets faster and more reliable. Coming to Fast Charging, it has support for both the QuickCharge 4.0 and the new 4.0+. Lastly, the Security of this SOC is top-notch as well. You can read all the detailed specifications here at Qualcomm’s official website. Let’s check out the benchmark scores of some of the popular SDM845 devices that have launched so far. Without any doubt, this chip has blown away the Antutu Benchmarking. No chip (including Exynos 9810 and Apple A11 Bionic) come close to it in the Antutu score. The OnePlus 6 leads the table with a gigantic score of 276,510 points followed by Mi Mix 2s (273,741 points) and Samsung Galaxy S9+ (264,823 points). On GeekBench Single-Core performance, this chip attains the highest score ever for a Snapdragon chip. However, the Apple’s A11 Bionic and Samsung’s Exynos 9810 Platforms are way ahead in Single-Core performance. But the Multi-Core score of this processor is really impressive. In Single-Core department, the average score of these three phones lies in between 2,400 and 2,500 points. 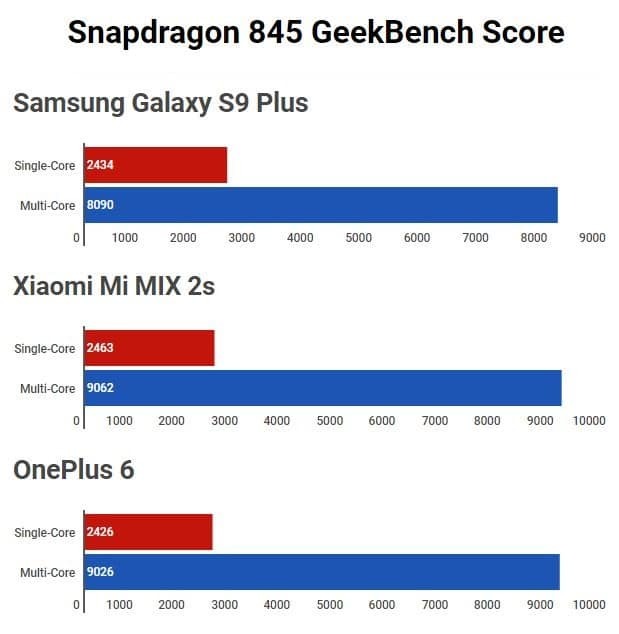 In Multi-Core performance, both the OnePlus 6 and Mi Mix 2s cross the 9,000 points mark but unfortunately, the Galaxy S9+ is 1,000 points behind the other two. We have already reached a stage where it is nearly impossible to observe any real-life performance differences between two high-end chips. If you compare it with Snapdragon 835 (or even with Snapdragon 660) phones, you’ll barely observe any difference in real-world scenarios. They are already too fast but the AI based processing in 845 optimizes the performance and makes it more reliable in the long run. Snapdragon 845 devices are lightning fast when it comes to general as well as during heavy use. The Modem and the Camera’s image processing is super fast too. Opening apps and surfing the web and other general tasks are done in an instant. Adreno 630 Visual Processing Subsystem enhances the graphics acceleration, rendering and Extended Reality capabilities of the device. Thanks to the Hexagon 685 DSP and Quad-Channel LPDDR4X RAM, the performance is unparalleled. Is there any chance it may lag? Not even mid-range smartphones lag these days. Snapdragon 845 is an absolute beast in terms of performance. The only way it may possibly lag is when an application goes unresponsive due to a bug or when you’re using a heavily customized version of Android having poor software optimization. It not only can run every Android game out there, it can actually run them at 4K resolution. For 4k Mobile Gaming, get the Sony Xperia XZ2 that sports a 4K display. You can also look at the Samsung Galaxy S9 having a display resolution of 1440 x 2960. Also, we cannot simply ignore the Xiaomi’s Black Shark. This phone is actually made for mobile gamers and has liquid cooling! In short, we can call the Adreno 630 the GTX 1080 Ti of Mobile Gaming (just kidding). For Graphics Intensive usage and gaming, that’s the best Qualcomm has to offer and I highly recommend it. 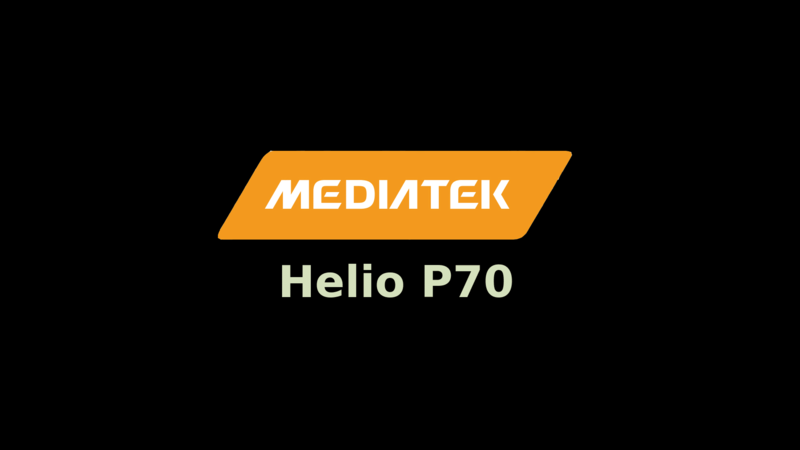 It is manufactured using the new 10nm FinFET LPP which is great for saving your battery life. Also, the lower power cluster of this CPU consists of semi-custom Cortex-A55 cores that deliver good performance while conserving the battery. Lastly, the AI Processing further optimizes the system to use the least power as possible. In short, this processor is very power efficient and optimizes the battery consumption. With the support of AI, newer Fast Charging technology, Dual VoLTE Support, and Gigabit LTE Modem, this chip excels in all departments. It also takes the camera and extended reality capabilities of a Processor to a whole new level. If you want to see the rankings of all the Snapdragon Processors, check out: Snapdragon Processor Rankings. Let’s check out how well is this SOC in comparison with other popular ones. Snapdragon 835 is its predecessor and its CPU and GPU performance is slightly lower than it. Nevertheless, 835 is another great chip for flagship devices. The Kirin 970 is comparable to 835 but not as good as 845 due to its Cortex-A73 cores and GPU. Exynos 8895 is another great chip that powers Galaxy S8+ and Note 8 and it is better than Snapdragon 835. But being a previous generation chip, it is not close to 845 in terms of performance. The latest Exynos 9810 offers better CPU performance, (Single-Core performance to be exact). But the GPU of Exynos 9810 is weaker than 825. Even though its Antutu Score is lower, on Geek Bench and most other benchmarking apps, it is ahead of 845. In fact, it is currently the second most powerful chip after Apple’s A11 Bionic. Even though it is just a midrange chip, Snapdragon 660 packs a lot of power. For flagship experience in a mid-range phone, SD 660 is highly recommended. However, it is far from 845 in terms of performance. The Snapdragon 636 processor is another great chip for mid-range devices but it is slightly weaker as compared to the Snapdragon 660. And the difference between 845 and 636 is huge. Even with the new Snapdragon 845, Qualcomm failed to defeat the A11 Bionic in terms of raw CPU performance. The A11 Bionic has a massive Geek Bench score of 4000+ points on Single-Core and 10000+ points on Multi-Core . For someone to looking to buy an expensive Android Phone in 2018, the most common processor that you’ll find is the Snapdragon 845. Even these $500~$600 flagships like the OnePlus 6, Xiaomi Mi 7, Mi Mix 2s have this chipset. Without any worries, you can easily go ahead and make the purchase. This processor will surely not disappoint you. As you’ve figured out that it’s probably the best processor out there. So, what’s next? Make sure to check out reviews of individual devices. Every phone is different and even with the same chip inside them, the performance may vary. Also, don’t forget to save some money on your way. The most expensive device is not always the best. Even some of those $500 ones are excellent and can fulfill the needs the general user needs. The major difference that you may find in flagships phones is their camera performance. Most of them use different camera setups with different sensors, apertures, and software-level optimization. Also, the bokeh effect we see in Portrait mode is usually made possible with the help of software. This is usually done using various Artificial Intelligence techniques like Semantic Image Segmentation. The better and efficient the algorithm is implemented by the OEM, the better is the portrait mode. Pixel 2 is one of the best phones in terms of portrait photography and I do hope to see the Pixel 3 take it one step further. Here’s a list of Snapdragon 845 for your reference.